John Warnes pauses only momentarily in his start-up preparations. “You’d like to have eye and ear protection?” he asks. Without waiting for a reply, he adds: “Most people do,” before disappearing into his workshop to retrieve ear plugs and safety glasses. He hands them out and then equips himself with both before applying the petrol-powered leaf blower to the compressor intake bellmouth. A look of concentration turns to a satisfied grin as the machine starts, an escalating high-pitched whine heralding the arrival of turbine speed and boost. A few minutes later, after shutting down the machine and swapping the fuel from petrol to kero, he turns on the second fuel pump, the one that runs the afterburner. And the need for the ear plugs becomes clear as a superheated roar fills the backyard, the jet blast sweeping away leaves tens of metres distant. John’s a man after any AutoSpeeder’s heart. We’ve previously run stories on his turbo RB25-powered Holden Commodore and, more recently, on the PC installation in his Ford Falcon XR6 turbo. And it was while chatting during the shoot on the XR6 that we learnt of John’s jet-powered interests. But at the time, the jet wasn’t powering anything – so while it was interesting, it wasn’t a must-run story. But then we heard about the jet scooter. 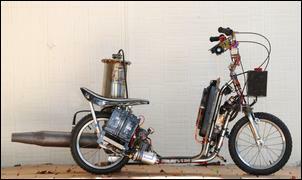 John tends to downplay the work that’s gone into the design and build of the scooter, but for our money it shows amazing ingenuity and dedication. Based around a sleeve-bearing TO4E turbo (one that, incredibly, once did duty in a 10-second rotary drag car! ), the scooter is propelled purely by jet thrust. But how do you turn a TO4 into a jet? 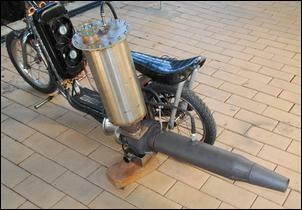 Basically, you feed the compressor outlet into a specially designed combustion chamber. The fuel is squirted in through a high pressure injector and once ignited by a sparkplug, continues to burn. The expanding gases drive the turbine which in turn spins the compressor faster, pumping more air into the combustion chamber. The speed of the turbo is controlled by how much fuel you add; the propulsive power comes purely from the thrust of the gases blasting out of the turbine exhaust, which is fitted with a contracting nozzle to increase speed. It’s not dissimilar to the very first aircraft jets, which also used centrifugal compressors and external combustion chambers. But saying it all in one paragraph is easy compared with actually doing it... not to mention getting the complete assembly light enough to fit on – and propel – a scooter. The intention was never to make a road-going, practical vehicle - it was much more a case of fun experimentation. And what an experiment! So let’s have a look at the technology in detail – like, how do you lubricate the turbo? After trying different oil pumps, John settled on a Shurflow positive displacement diaphragm pump that supplies oil to the turbo through a filter. 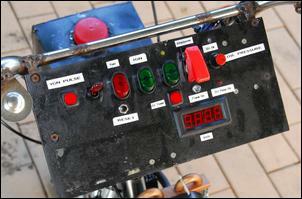 As with all the on-board electrical systems, it’s powered by a sealed lead acid battery. 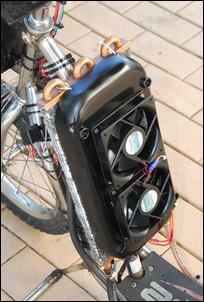 The pump draws about 2 amps, pumps at 30 psi (oil pressure is monitored with a dedicated oil pressure gauge) and can handle temps of up to 150 degrees C. But so that limit is not reached, the scooter runs a large oil cooler with airflow aided by two ex-PC electric fans. An oil pressure switch shuts down fuel and ignition if a pressure of at least 15 psi isn’t present. The turbo’s oil drains into a fabricated sump - a wide, long stainless steel box whose large surface area helps in de-aeration. A sight glass on the side of the sump shows oil level; about 750mL is used in the system. The oil is a mix of car and jet oil, thin enough to flow easily but not so thin that it won’t build pressure. 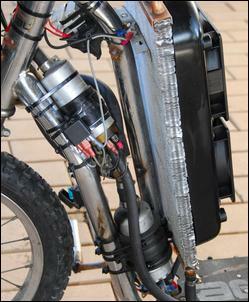 A vent tube connects the sump to the atmosphere. This line has an in-line air solenoid which shuts off the vent when the jet is running but opens the vent when the jet stops. This prevents the pressurised sump pushing oil into the turbo when the jet is not running, while still allowing the pressurised oil supply system to aid sealing when the turbo is on boost. The system was added when it was found that after stopping, oil would otherwise flow into the turbine, creating clouds of white smoke. 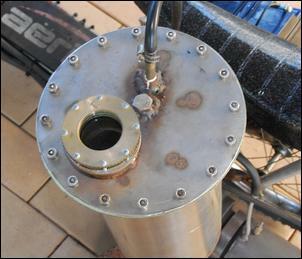 The combustion chamber was fabricated by John in stainless steel. It consists of vertically orientated inner and outer cylinders, with the inner cylinder perforated. The top third of the inner cylinder has small holes drilled in its walls; the next third of the cylinder has larger holes; and the bottom third of the cylinder has the largest holes – 13mm in diameter. Fuel is added from the constant flow injector positioned at the top and air from the compressor flows into the space between the inner and outer cylinders, entering near the base. The design took many hours to get right, aided by a sight-glass positioned in the upper wall of the combustion chamber that allows the burn to be actually seen. Maximum pressure in the combustion chamber is 1 Bar. 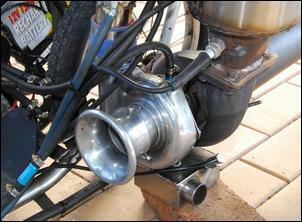 The afterburner uses a fuel ring positioned at the turbine outlet. Twenty small holes are drilled in the ring for fuel flow. The exhaust out of the turbo has enough residual oxygen to burn the afterburner fuel – John comments that you can stand (a fair way back!) from the exhaust and it smells just like an aircraft jet, without any excessively rich mixtures or smoke. So how does the fuel get to the system? Two fuel pumps are used – one for the main burner and the other for the afterburner. Both are high pressure roller cell EFI car fuel pumps. The front-mounted tank feeds both pumps through a T-piece and fuel filter. From there the fuel from one pump – a VL Commodore Bosch pump - is pushed to the main combustion chamber nozzle, a self-designed and manufactured brass item. 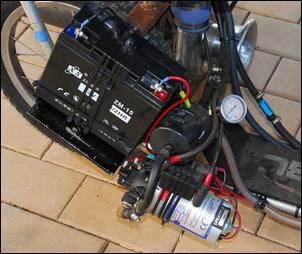 Pump speed – and so fuel flow – is controlled by an electronic kit that gives a variable pulse width output. This effectively runs the pump from 8V to full battery voltage, with rider control by a lever that turns the control potentiometer. A safety circuit won’t let the fuel system run without oil pressure, the fuel switched on and a combustion pressure of at least 0.1 Bar. The latter is so that if the flame goes out, fuel is cut off. 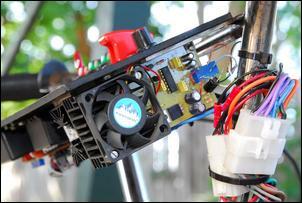 An over-ride switch for the combustion pressure sensor allows easier starting. Finally, a turbo timer is built in so that the oil supply for the turbo will run for 10 minutes after shutdown, and a digital voltmeter shows battery voltage. John’s scooter isn’t the sort of machine to take down the local shops. For starters, the noise is incredible, not to mention that the machine could easily wreak havoc by burning pedestrians, dogs, car paint-work... The duration of running is also limited by battery capacity. We don’t reckon the local constabulary would much appreciate John’s ingenuity either.